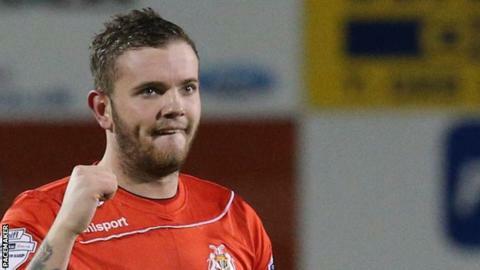 Portadown striker Darren Murray has had a transfer request granted by the Irish Premiership club. It is the second time in a year 24-year-old Murray has asked for a move, the Ports having blocked a similar request at the start of the season. On that occasion, Cliftonville were considered favourites to sign the former Donegal Celtic font man. Other Irish Premiership clubs will be interested in Murray's availability, as will Derry City boss Kenny Shiels. Portadown said Murray would only move if a satisfactory offer was received. In the meantime, the unsettled front man would continue to be available for selection by Ports manager Ronnie Mc Fall. Murray joined Portadown in 2012 and signed a new two-year-contract midway through the 2014/15 season. Last year he had trials with Scottish clubs Inverness Caledonian Thistle and Greenock Morton. "Darren has asked for a transfer as he is not happy overall and we have agreed to put him on the list," said Ports boss Ronnie McFall. "We think it is in the best interests of the club, and all concerned, if he moves."